your well-being, your physical health, and your psychological well-being. Firstly homes with Green plants tend to have more Oxygen inside your home. The oxygen helps you with better health; Oxygen improves your immunity system, speedy recovery from illness, growth of cells.etc. Lack of Oxygen, creates an incresed tendency to commit suicdes. are healthier. UN reported that air pollution is the No 1 killer of the human being. 1 in 8 of dying human is due to polluted air. cleans the grey waters, etc.It helps the good bacteria to fight the bad ones. 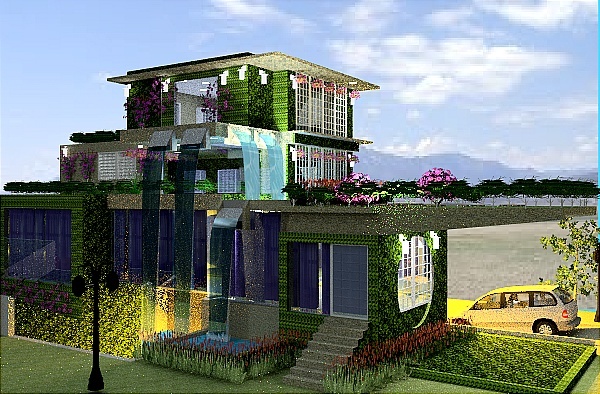 designing homes with green layout and efficient layouts. Research shows that Green homes make you more Presenteeism, more aware of happenings. It makes one more attentive and improves cognitive responses. straight edges and straight lines produces stresses people. Organic forms reduces the stress on th eyes. Green homes keep your homes cool on a hot day and warm on a cold day. lesser and you feel better because it is cooler etc.It saves the heating and cooling bills. Green and sustainable homes increase the property value of your home. Research shows that property values increased by 10 to 30% by Greening your homes. Call us at +60172246801 ,on how we can help you in your homes. The Kyoto Protocol,1992 in the UN Framework Conventions on Climate Change but adopted in 1997 established the basis of Carbon Trading, Carbon offsets. 192 nation agreed to reduce Carbon emissions, which Identifies the 6 GHG gasses as 1) CO2 2) methane, 3) N2O 4) hydrofluorocarbon 5) perfluorocarbon and 6) sulphur hex-fluorocarbon. All these gases are referred to as Carbon emission, Carbon dioxide is the weaker global warming effect but the amount of it is the largest amount. Before the Kyoto Convention 2 Convention were held to establish the basis of Carbon emission, what is was considered as Carbon emission etc. 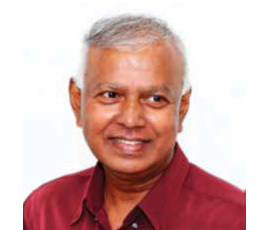 In Malaysia, the Ministry of Natural Resources and Trade is in charge of CDM. In Malaysia, 100 tonnes were traded in 2008, at RM4.8 Billion. I ton of carbon was sold at RM48. 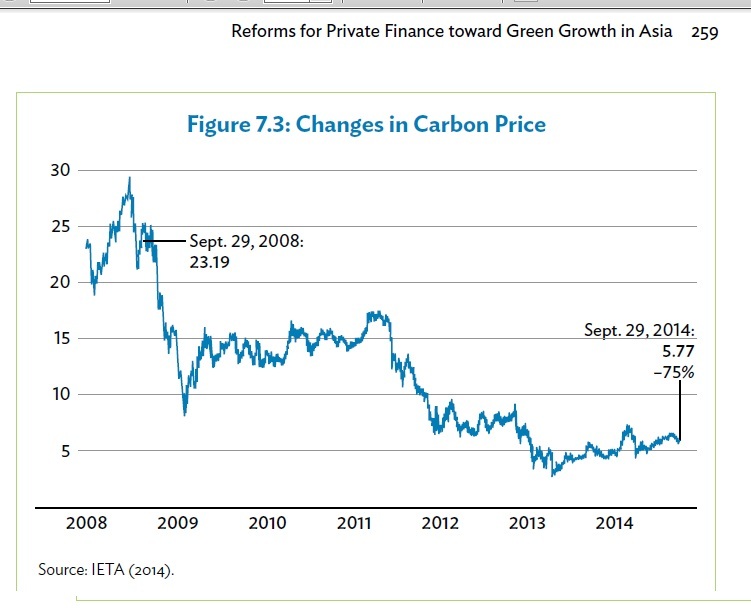 The price of carbon rallied from US 25 – US 12 over these years. e) Investing in a Carbon reducing projects such as Renewable energy projects, Geo-Thermal, Biomass, PV solar panels, micro turbine and wind turbines. How much can you gain by Carbon Trading? A typical building as in a 100,000 sq ft of gross built commercial space up area can offset carbon 390 tons of carbon per year. The top 80% of 10 Architectural firms and 70% of the top 20 Architectural firms use The Challenge 2030.whereby all developments, new buildings and major renovation shall be carbon neutral by 2030 in the US and thereby reducing the temperature by 2 degree below the pre-industrial times.Net Zero Energy Buildings are also refereed too as Zero Energy Buildings. Ashrae is a strong supporter of NZEB, and where Ashrae Vision 2020 was developed to promote energy Efficiency. NZE is defined as uses as much energy as it produces as measured at the site. The parliament passed a directive to achieve NZE by 2019 but focused on residential buildings and not commercial buildings: UK-Zero Carbon Hub to be carbon neutral by 2016, Germany-Passivhaus, Netherlands-energy neutral by 2020, France to be Energy positive by 2020. Is an energy labelling program of EPA( Environmental Protection Agency) and DOE( Department of Energy) It labels energy efficient products, homes, and commercial buildings. It scores on a table of 1 to 100.100 is a top performer. Energy Star does not recognize NZEBs. But the NZEB would score 90 in this program. Net Zero Energy-if this imperative is not achieved it will not be qualified for the Living Building Challenge. The definition of NZEB are on: renewable energy, photo voltaic, wind turbines, water powered micro turbines, direct geo thermal. Biomass or combustion of any kind is not allowed. Hydrogen cell is allowed if energy is fueled by Hydrogen. Off grid connection is a must. What are the Sill Logs? Sill logs are the logs that rest directly on top of the foundation and its connected to it by the anchor bolts. How to Choose Your Logs? Just about any type of log can be used, as long as it’s relatively straight and it is around 8”-10” diameter. It has only minor tapering no more than 2”. And the length for it is around 16 ft.
Conifers such as pine, fir, spruce and tamarack are preferred because these softwoods are workable, durable and relatively lightweight. Hardwoods, particularly oak can also be used, though their sapwood is highly susceptible to infestation by borers and fungus. After completing the foundation based on the house plan the work on the upper part of the house begins. Note: this is an important part of the job because if the sills are not laid as mentioned in the house floor plan and if its not laid squarely and securely that might effect the whole structure. Steps of Constructing the log house Sill Log. If you don’t want a full basement, you must excavate the house plan dimension at least below the frost line, install footings and construct a wall up to 20 in. above grade level. You must also install piers within the foundation walls as mentioned in the architecture plan to support the floor girder. Also, install anchor bolts along the top of the walls to attach the sill. Begin floor construction by hewing or cutting flat the bottom of the sill logs. Then make holes in the sill logs to fit in the anchor bolts and install sill sealer or a termite shield according to the local building code. The corner joints are made by bottom notching the logs based on the house design. Hew flat the top of the girder and install it over the support piers. Join it to the sill with a mortise and tenon joint. Drive nails through the top of the tenon and into the mortise to complete the joint. Install the sub flooring perpendicular to the direction of the joists. Now you’re ready to start on the walls as designed in the architecture plan. Many different types of notches can be used to join the logs, but a good choice for the beginning log builder is the scribe, fit, round-notch method. It features semicircular notches cut in the bottom of the logs to fit over adjacent logs. Also, a V-shaped groove is cut down the length of each log bottom so the entire length can sit flush on the log below. Although this method is slower than others, the corner joints are self-draining-water running down the outside of the house hits the log tops and runs off, instead of being trapped in the notch. The V-grooves also eliminate air drafts between the logs. The joints between courses do not need chinking, so you can avoid one of the most chronic maintenance problems of log homes: repairing cracked chinking. Foxes at the Log House Museum? This article on how to build a Log House-Part 3 is the last part of the session, which deals on the subject on how to build a Log House in totality from the foundation to the roof. It can be made of concrete, concrete blocks or concrete faced with stones. If made of concrete it can be Single pour and Double Pour (footing and foundation). It’s not used as much as the separately poured footing and foundation. However it simplifies the task and cut down on time. Lay out the outside dimensions of the footings, the wall thickness and outside boundary of the wall on the batter boards using the house floor plan. Then position the builder’s string to show the dimensions. Excavate the footing and construct the forms. Bring All Service pipes in below the footing and frost line before pouring the footing. The footing is usually poured separately from the foundation. If the soil is stable, the footing is poured directly in a trench dug without forms. If the soil is less stable, forms must be constructed to hold the concrete in place. If pouring without forms drive small wooden stakes into the soil at the bottom of the trench where their tops should be level with the height of the footing. Pour the concrete and smooth more or less to the height of the stakes then pull the stakes out and fill the holes with concrete and smooth over. Form a key in the footing to help hold the concrete foundation in place and it can be done by using a beveled 2”x4”. However in the tropical countries water stop is need to be added to prevent water seepage. Reinforce the footing with two to three reinforcing bars spaced about 3”-4” off the bottom of the trench. Make an inspection after the form for the footings are completed. After the footing has cured for 5-6 days the foundation can be formed. Remove the footings forms and construct the form for the foundation. Individual sections of forms should be nailed together from the outside. Set up the outside forms first and level it by using the carpenter level and then do the same on the inside forms. Higher and larger foundation walls should be poured slowly to allow the concrete enough time to set up. A drain should be placed around the foundation to help carry off excess water that collects at its base. Put a 2” layer of gravel around the outside of the bottom edge of the footing. Then put clay drainage tile or perforated plastic on top of this around the outside of the footing. Throw from 2”-6” of gravel over the clay drainage to extend it up over the top edge of the footing by at least 2”. If you need insulation for the basement, install 4” thick batts of rigid foam with moisture barrier below the concrete floor and on the gravel. It can be installed on the outside of the foundation wall as well. Usually poured after the foundation forms are removed. Before pouring the floor first position the drain as needed. The floor drain should be ½” below the surface of the finished concrete floor. Pouring basement floor should be done with a fast pace to prevent the concrete from setting up before you can get it all finished.